You've got your house key. You've got your car key. You've got your shed key. You've got your parents' key. You've got your work key. You probably even have a key or two that you're not quite sure what they're used for. The point is that you have a bunch of keys and you probably need a handy way to keep them organize. Wouldn't it be great if there was a way to combine your favorite superhero with a quick and easy way to carry all of your keys? 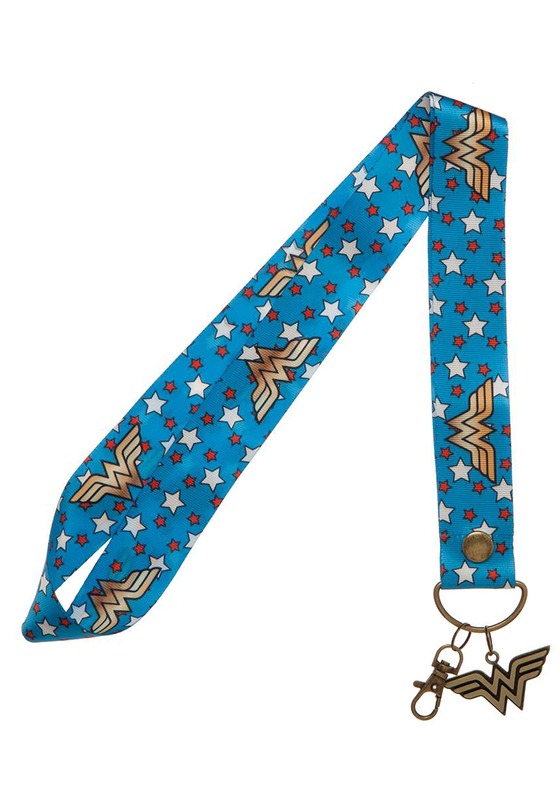 This DC Wonder Woman lanyard helps you carry your keys in one place with the help of DC's greatest superhero. This lanyard has a light blue ribbon, but it comes with a nice little surprise. Gold Wonder Woman symbols are printed on the exterior, along with white and red stars. The bottom of the lanyard has a metal d-shaped ring, which fits all of your important keys. It also comes with a clear card sleeve, so you can place your ID badges inside of it. Of course, the best part of this lanyard has to be the Wonder Woman charm that's attached to the bottom. Get it as a gift for the DC fan in your life, or just use it to upgrade your plain lanyard for work or school!